We are grateful to those who completed our recent online questionnaire. 121 people participated and we are heartened by the responses. The following is a sampling of the survey results and comments received. 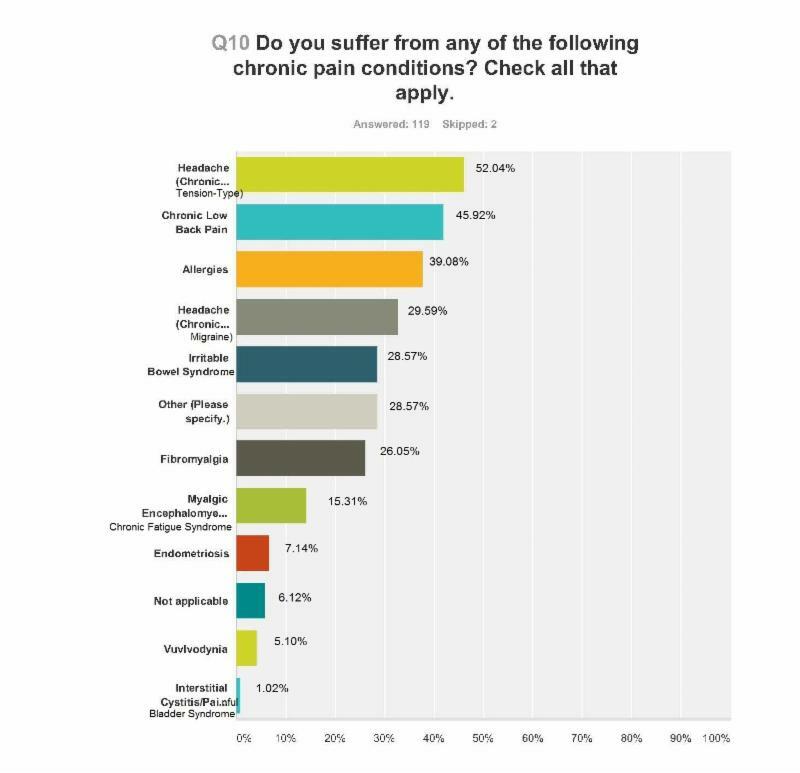 As you may know, September is Pain Awareness Month so we are including the survey findings related to pain. "I have been on so many different medications that my body has built up a tolerance and nothing works. The latest treatment was Fentanyl patches that I became addicted to and the pain was not reduced at all. I presently take Tylenol once in a while to ease the discomfort but live with pain day and night." "I am very discouraged because it seems like nobody knows of any effective treatment and some of the treatments available are actually dangerous. Therefore I am just living with it because the alternatives are worse." "It's such a frustrating condition, I was a professional brass instrument teacher. The playing has caused TMJ problems and I'm on Workcover. They try to discount my condition. I feel so sad about my lost profession and the added aches and pains. I see a psychiatrist and a psychologist. Nothing helps my playing." Publishing and distributing the meeting summary and recommendations from our Seventh Scientific meeting, Genetic, Epigenetic, and Mechanistic Studies of Temporomandibular Disorders and Overlapping Pain Conditions. Creating a new program to address the needs and concerns of TMJ implant patients and improve communication with all stakeholders involved. Increasing the broader base of scientists researching TMD and educating medical professionals about TMD. The TMJ Association's last three scientific meetings have highlighted a paradigm shift in the way temporomandibular disorders are perceived and studied. They are now characterized as complex conditions like hypertension or diabetes, not limited to a dental or jaw problem in isolation. Researchers are now looking at these conditions together and the mechanisms common to them since they occur together more often than could be predicted by chance. The thinking is that these debilitating problems experienced in various organs of the body have their origin in pathology at the highest levels of the brain and central nervous system. These discoveries are paving the way for new targeted therapies, which will change the way TMD is understood and treated in the future. In order to accelerate and advance the science in this area, The TMJ Association has adopted the The Chronic Pain Research Alliance (CPRA) as one of its many programs and initiatives. This initiative will expand our existing efforts as we continue to listen to the patients. 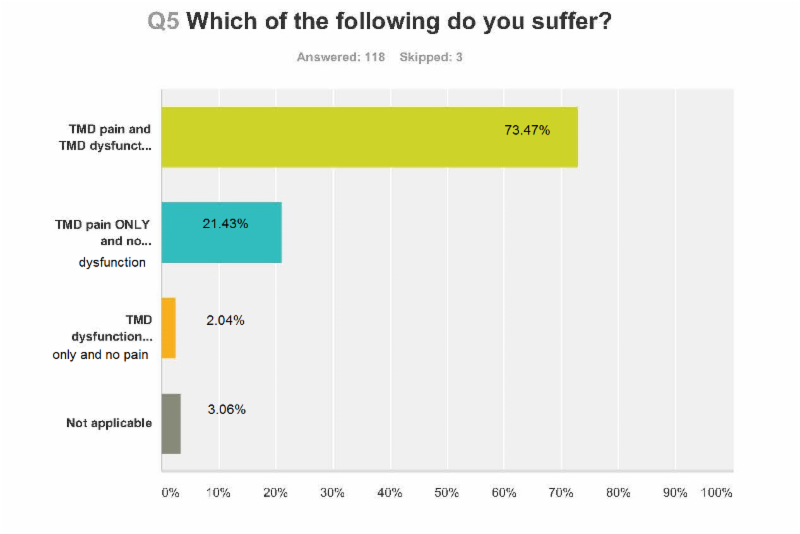 Data from our own recent survey (reported above) as well as from the Orofacial Pain, Prospective Evaluation and Risk Assessment (OPPERA) study, show that the vast majority of TMD patients suffer from other pain conditions addressed by CPRA, furthering TMJA's commitment to addressing the spectrum of medical issues faced by TMD patients. The Chronic Pain Research Alliance (CPRA) is the country's first and only research-led collaborative advocacy effort dedicated to addressing Chronic Overlapping Pain Conditions (COPCs). Working with a variety of invested stakeholders - leaders from the clinical and scientific community, patients, advocacy organizations, industry and federal health research and policy agencies - CPRA's goal is to improve the lives of those suffering with multiple pain disorders. We invite to you learn more about the CPRA and welcome your thoughts, feelings, and comments. 1. 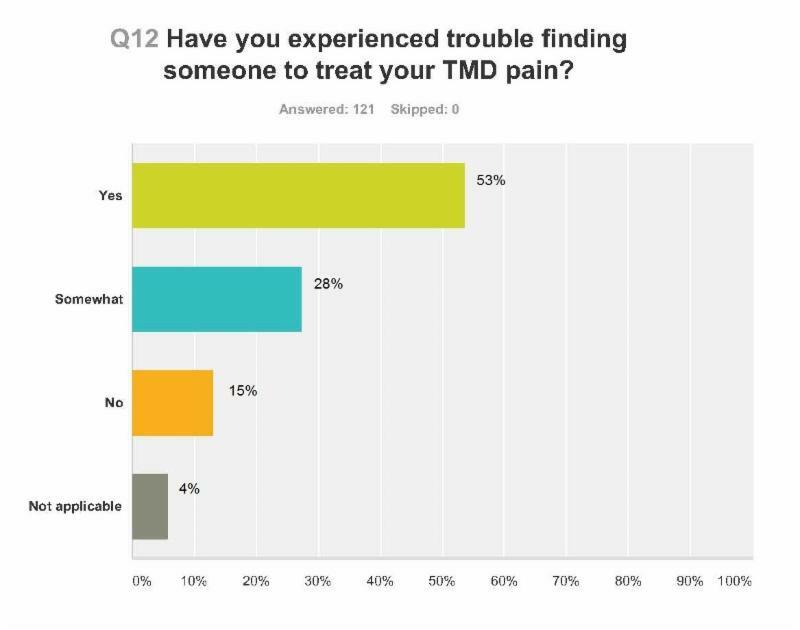 Many times you told us that TMD is not a dental condition, it's a medical condition and medical professionals should learn about this. 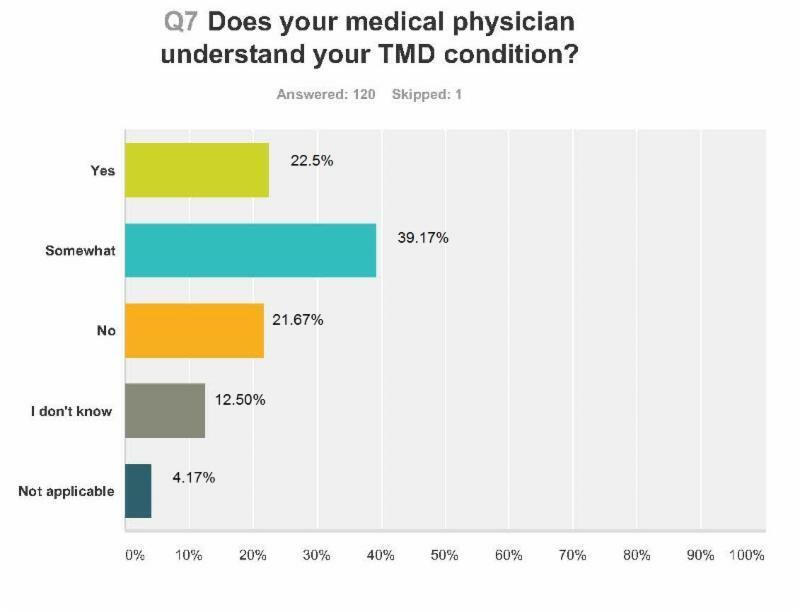 Because of the connection TMD shares with other medical conditions, TMD will finally get the attention it deserves from the medical community. 2. TMD will be included in more research studies looking at both commonalities and differences it shares with an array of other pain disorders, providing a braoder base of scientific specialties to research our condition. 3. New treatment options for TMD will be accelerated and will benefit all TMJ patients, even those without overlapping conditions. Research is showing common mechanisms responsible for chronic pain, regardless of the body/organ location of pain. This will identify treatments that specifically target the responsible mechanisms, which can be safely and effectively used across conditions. 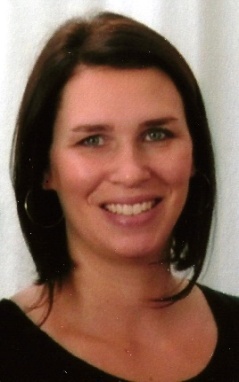 The TMJ Association is pleased to welcome Christin Veasley as the Director of the Chronic Pain Research Alliance. We first began working with Chris at the 2008 TMJA scientific meeting where she participated in the patient roundtable representing the National Vulvodynia Association. Nine other leaders from nonprofit advocacy organizations took part, representing chronic headache, generalized pain conditions, irritable bowel syndrome, endometriosis, interstitial cystitis, fibromyaglia, chronic fatigue syndrome, rheumatoid arthritis, and temporomandibular disorders. After the meeting, several of the leaders came together to form the Overlapping Conditions Alliance, which evolved into the Chronic Pain Research Alliance (CPRA). Click here to read about the CPRA's mission, vision for the future, and accomplishments. Chris has spent her career advocating for rigorous multidisciplinary pain research. She currently serves as a member of several other collaborative alliances, federal committees/initiatives, and public-private partnerships working to promote pain research, education, treatment and prevention. She is the former Executive Director of the National Vulvodynia Association. By working together, the CPRA will draw attention to the needs of the many patients, the majority of whom are women, who have Chronic Overlapping Pain Conditions including TMD. Patients who develop symptoms of temporomandibular disorders (TMDs), face certain challenges when weighing the benefits and risks of new treatments. Because the TMD field is well known for having diverse opinions, different practitioners may offer a wide variety of treatment options for the same condition. Some of those options may be relatively conservative, while others are rather invasive. This difference is often represented as a choice between reversible and irreversible treatment. In a recent paper, Drs. Greene and Obrez have suggested a novel way of assessing the choice between the proposed treatments. Their paper, entitled "Treating temporomandibular disorders with permanent mandibular repositioning: is it medically necessary?" focuses on a central issue in the TMD treatment controversy: should the position of the lower jaw (mandible) be irreversibly changed as a part of treating these conditions? Click here to read the full article. Many TMJ patients have told us they suffer from tinnitus (a ringing or buzzing sound in the ears). Neuroscientists have just uncovered a brain malady that is responsible for tinnitus and chronic pain. Both share this unexpected link. Click here to read more about this discovery. We highlight this news not only because many TMD patients suffer from tinnitus and chronic pain but because scientists researching TMD are also now looking at its origins in the brain. These discoveries are exciting as they hold new possibilities for targeting treatments in the brain instead of focusing treatments on the end organs (the jaw and the ear). 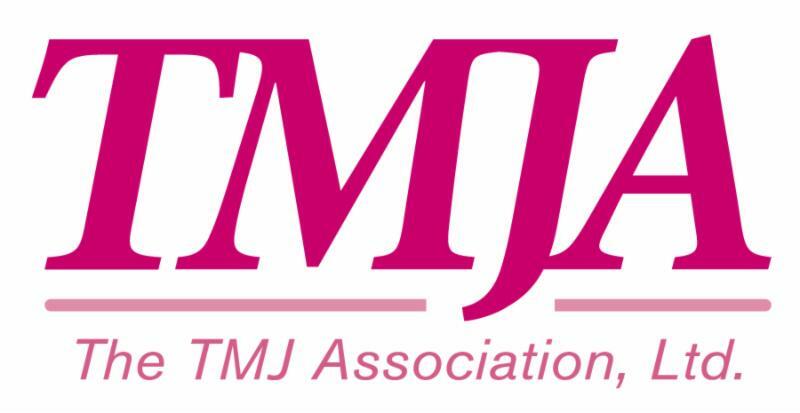 For over 20 years The TMJ Association's advocacy efforts have resulted in Congressional report language, which communicates to federal agencies, such as the National Institutes of Health (NIH), that our elected officials are concerned about the plight of TMD patients and initiatives needed to improve their lives. This directive has a powerful influence on the decisions made by the government agencies. We have established personal contacts with staff and elected officials and garnered their support by reporting regularly on TMD research, as well as letting them know what we, the patients, need. The U.S. Congress remains vigilant to the needs of the TMD patients as well as to the progress the NIH has and continues to make on their behalf. For these devastating conditions we want the best science this country has to offer, and we are fortunate to have the support of members of the Senate Labor, Health and Human Services, Education and Related Services Appropriations Subcommittee, responsible for funding to the National Institutes of Health. Their support deserves our thanks, so please take a moment to send a note of appreciation to the committee members. The Committee appreciates the collaboration of National Institute of Arthritis and Musculoskeletal and Skin Diseases and National Institute of Biomedical Imaging and Bioengineering with National Institute of Dental and Craniofacial Research in organizing the May 2013 Roundtable on The Temporomandibular Joint in Health and Disease. A panel of experts from a variety of fields, many outside of dentistry, reviewed the state of the science on the jaw and associated muscles and developed a list of research recommendations. The Committee encourages NIH and its roundtable co-sponsors to work collaboratively to implement the recommendations and recruit the intellectual and scientific talent necessary to resolve the outstanding issues of diagnosis and treatment. What is the National Institutes of Health (NIH)? Why is it Important to TMJ Patients? The NIH, one of 10 federal agencies under the direction of the U.S. Department of Health and Human Services, is the primary federal agency that conducts and supports medical research. With the support of the American people, the NIH annually invests over $30 billion in medical research. The NIH is comprised of 27 Institutes and Centers. It provides leadership and financial support to researchers in every state, and throughout the world. Helping to lead the way toward important medical discoveries that improve people's health and save lives, NIH scientists investigate ways to prevent disease, work to determine causes, and establish treatments, and even cures for common and rare diseases. One of those 27 components is the National Institute of Dental and Craniofacial Research (NIDCR), which supports the bulk of research on TMD. Now that scientific understanding has uncovered the neurological and other complexities of TMD, an increasing number of agencies of the NIH are recognizing that they have a significant role in solving the puzzle of TMD by also providing funding for integral research programs.